Tony Nogueira regains his crown, and Katrina Gerhard sets a course record in the women's wheelchair race. 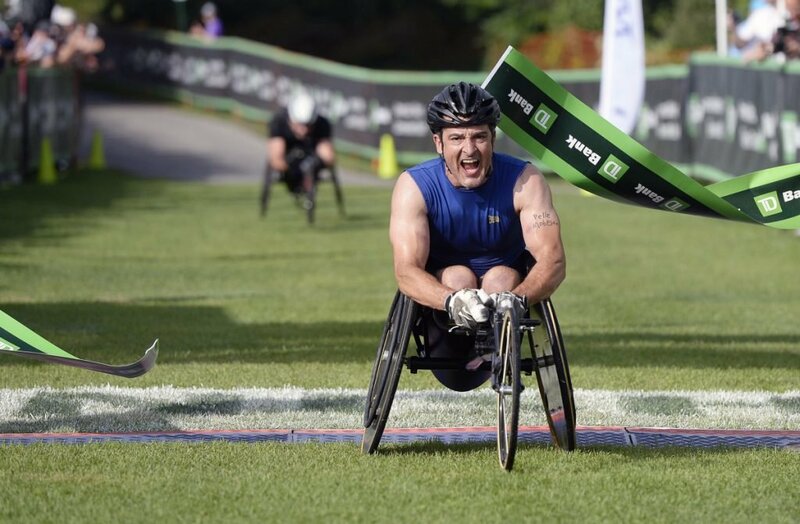 For the second consecutive year, a late crash proved costly for Hermin Garic in the wheelchair division of the TD Beach to Beacon 10K. Garic and Tony Nogueira were competing for the lead throughout most of the second half of Saturday’s race until Garic took one of the last turns too fast and crashed into a barricade. Nogueira, who was right behind, clipped Garic but was able to right himself and win in 23 minutes, 22 seconds. Garic finished second, six seconds behind. It was Nogueira’s 11th career victory at Beach to Beacon. 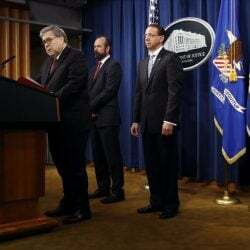 The outcome was especially difficult for Garic, 28, of Utica, New York. Not only did the mishap crack his wheelchair and cost him first place, but it happened in the same spot he crashed last year. He wasn’t in position to win in 2017, but it did push him out of the top three. “There were wet conditions (Saturday), and on that final turn I tried to slow my momentum,” he said. “I was having flashbacks to last year, but it’s part of the sport. Nogueira placed second at last year’s Beach to Beacon. James Senbeta, the course record-holder (21:46 in 2015), finished third for the second straight year. He sprinted to the lead and was ahead for the first three miles before falling behind. He noted that he started a job in Chicago less than a month ago, and training has taken a backseat to moving and settling in. “I’m happy because I did OK, but at the same time I’m not where I am compared to past years,” Senbeta said. In the women’s division, newcomer Katrina Gerhard of Ashburnham, Massachusetts, raced out to a quick lead and set a course record of 26:49. She finished 1:20 ahead of last year’s winner, Hannah Babalola, a Nigerian living in Newark, New Jersey. The previous course record of 28:01 lasted for nearly two decades. It was set by Laurie Stephens of Wenham, Massachusetts, in 1999. Gerhard, 21, said the rolling course presented challenges of keeping her momentum, but she concentrated on going fast down the hills to overcome the uphill sections. In all, 14 competitors (nine men, five women) raced Saturday – the largest wheelchair field at Beach to Beacon. Last year’s field was 10. HEAT AND HUMIDITY caused an increase in the number of runners who sought medical attention. Dr. Michael Baumann, the race’s medical director and a critical care specialist at Maine Medical Center, said 108 runners were treated and two were transported to the hospital. Baumann said the medical staff at the race typically treats 70-80 runners each year. But with Saturday’s conditions – temperatures in the mid-70s and humidity at nearly 90 percent – runners were hit by heat-related symptoms. In most cases, Baumann said, an ice bath was enough to cool the runners down. “We find that if we can cool them down in the first half-hour, most will walk out on their own,” he said. DAN SMITH, a 40-year-old from Shelburne Falls, Massachusetts, won the men’s masters division in 33:19. That was 32 seconds ahead of second-place finisher Ian Nurse, 40, of Brookline, Massachusetts. In the women’s masters race, 40-year-old Dawn Grunnagle of Dallas finished first in 34:53. Jennifer Maranzano, 46, of Washington, D.C., was second in 35:49. The Masters division is for runners ages 40-49. The winners get $1,000 each. WINTERKIDS, a nonprofit organization that helps children develop healthy habits through outdoor winter activities, was the race beneficiary, receiving a $30,000 donation from the TD Charitable Foundation. As part of its running group, WinterKids enlisted two former Olympians from Maine, snowboarder Seth Wescott and luger Julia Clukey. Both were running the race for the first time. Wescott, who won two Olympic gold medals in snowboardcross, has a unique history with Beach to Beacon race founder Joan Benoit Samuelson: She was once his babysitter. Wescott has been involved with WinterKids since 2005 as a spokesman. While he’s never been involved in running – “I do it for some training, that’s all” – the sport still has a special place for him. His late father, James, was a longtime track coach at Colby College. Clukey, 33, who competed in the 2010 Olympics, retired in 2016. While she enjoys running, she said the chance to represent WinterKids was a special one. OLYMPIC GOLD MEDAL triathlete Gwen Jorgensen, 32, wants to return to Beach to Beacon. She ran it for the first time and was eighth in 33:19. Jorgensen, a native of Wisconsin now living in Portland, Oregon, retired from triathlon competitions last fall after winning the event at the 2016 Rio Olympics. She’s now focused on making the U.S. marathon team at the 2020 Olympics. This spring, Jorgensen ran a 10,000-meter race on the track at Stanford University in 31:55, so she thinks she can run the Cape Elizabeth course faster than she did this year. THE THIRD DECADE of Beach to Beacon races began with the awards ceremony going off the grid. A portable emergency solar power trailer from ReVision Energy and Pika Energy provided the juice for microphones and music at the top of a hill overlooking the Portland Head Light. Coupe said the unit used Saturday will be shipped to Puerto Rico, which suffered the worst outage in U.S. history following Hurricane Maria in 2017. Three other ReVision units – called Solar Outreach Systems (SOS) – are already on the island. THE NUMBER of finishers who ran 10-minute mile pace or faster was 3,655. That’s the lowest total since 2007 and represented 56 percent of the field. In the 1998 inaugural race, 88 percent of the field ran that fast. THE JOHNNY KELLEY AWARD, presented to the race’s oldest finisher, went to 90-year-old Robert Mountain of Gorham, who bounded up the steps to the stage to receive a plaque. In 1946, Mountain was sent to Fort Williams briefly as part of his induction into the Army before moving on to Fort Preble in South Portland. – Staff Writers Mike Lowe, Deirdre Fleming and Glenn Jordan contributed to this report.